Ardnacashel’s St. Patrick’s Festival ran over two weekends, making the best of the sunshine for the ponies. Competitors from as far away as Meath and Donegal came to test the superb Working Hunter tracks, built by Cathal Lynch in the International-sized fibre surfaced arena. Action kicked off on Saturday 17th March with the Horse Working Hunter in the morning, judged by David Lyons and ridden by David Wightman. Gillian Neill started her talented four year old grey mare, Lily with much success, winning both the 70cm Performance class and the four year old qualifier. Ardnacashel’s Caroline Crossin took a close second place in the 70cm Performance on her talented Ardnacashel-bred, Atty, while Victoria Teuton’s Shannaghmore White Smoke secured runner up in the four year old class, on his first outing. Robyn Catterall topped the 70cm Amateur with her consistently brilliant Levi, with Victoria White and her beautiful dun mare, Temple Bui in second place and later, fourth in the 80cm qualifier. Holly McClenaghan and Marx impressed the judges in the 80cm qualifier, winning a hot class, ahead of Lesley Webb riding Queen B. Lynsey McCartney and Logan’s Leap earned first place in the Cob Working Hunter, while Judith Bankhead was clear winner of the Small Working Hunter Horse on her own mare, Polly. The 90cm class was won by Jordan McClements onboard La Petit Alezan, ahead of Victoria Clarke on Huggy. The Irish Draught class saw three very competitive combinations go to battle. Broughshane’s Kathryn Knox and her own Braeview Codega stood at the head of the line up, with Meath’s Chris Carter in second on Hector and another Meath competitor, Marie-Helene Finnegan and Silver Foggy Dew in third. Beth Murray enjoyed a win with Kit n Kaboodle in the 1m class and a second placing in the 1.10m on Koko, who also later took Reserve Champion Working Hunter. Chloe Thompson had a super day with Beechburn Lass, taking second in the 1m and third in the 1.10m class. Lesley Webb and Kilpatrick Lord showed their experience in the 1.10m to lead the class and earn Champion Working Hunter horse. The afternoon welcomed the show horses and judges, Olaf Kerr and Richard Wilson (ride judge). Lesley Webb continued her winning streak, taking the four year old class on Chris, ahead of Marie-Helene Finnegan and Silver Elixir. Kathryn Knox showed off Braeview Codega’s versatility, winning the Amateur Show Horse, and were later crowned Supreme Champion. Lesley Webb topped the line up again in the Middle/Heavyweight section, this time with The Marksman, who was also crowned Hunter Champion, while Holly McClenaghan and Marx picked up second place in this class, and earned Reserve Hunter Champion. Caoimhe McKeown and her talented gelding, PJ topped the Small Hunter class and Sophie Anstey with Off The Island won the Maxi Cob class, and later the Cob Championship. Jordan McClements was back in the spot light, this time on Dream On Calypso in the Small Riding Horse, taking the class, the Riding Horse Championship and Reserve Supreme Champion in great style. The second weekend, rescheduled for the ponies, enjoyed a beautiful sunny day and huge turnout on Sunday 25th March. Working Hunter Judge, Fiona Morrow had a tough task in the early classes, with some very talented young riders keen to show off their progress. It was Eva McGimpsey on the wonderful Millford Spectacular who impressed in both the Cross pole class and the 50cm Performance. The pair also went on to secure Reserve Working Hunter Champion. Jocelyn Hutchinson steered Holthall Bandit into second place in the Cross poles and Flight of Earlsalo in to first place in the 60cm qualifier. Ellie McDowell had an unlucky last fence down to secure second place in the 60cm class on her beloved Peplow Dancing Queen. Holly Martin and Shantics Boy were successful in the 70cm Performance class, and Georgia Haire with Layla took the honours in the 80cm Performance. Megan Dumigan and Nebo Thomas Jones jumped a fantastic round to win the 80cm Qualifier with Stephanie Watt in second place in both this class and the Large Breeds M&M 85cm class. Anya Teuton enjoyed a win in the Large Breeds Working Hunter class on her dun Connemara, Shannaghmore Honey Bee. Sophie Morrow won both the 90cm Performance and the 90cm Qualifier on Derrymattery Fudge, with Ellie McDonnell in second in the latter class. Charlotte Keers steered Freddie in to first place in the 1m class, also earning title of Working Hunter Pony Champion. Julie Donaghy Simpson had a very long day judging the Pony showing, with only one short break for quick refreshments. It was Daniel McGimpsey and Hollybush Juno who earned top spot in both the Lead Rein Tiny Tots and the Hunter Pony Lead Rein, ahead of Melissa Griffin and Sammy in the Tiny Tots. Daniel also secured Reserve Champion Lead Rein Pony. Daniel’s cousin, Erin Gordon then partnered eventual Champion Lead Rein and Supreme Champion Pony, Maypole Stargate to win the Show Pony Lead Rein class. Sammy was back in the rosettes in the Family Pony, this time with older sister, Charlotte in the saddle. The talented pair later earned the title of Reserve Champion Hunter Pony. Ellie McDowell made a beautiful job of riding several ponies in consecutive classes, winning both the Combined Show Pony class on Llanarth Dignity and the Novice Show Pony class on Brookewater Antonio. Ellie McDonnell also partnered some stunning young ponies, earning runner up spot in the Novice Show Pony on Goldengrove May Dream, and winning both the 133cm Show Hunter Pony on Banksy Reveal and the 143cm Show Hunter Pony on Sonny Bill Williams. Susie Thompson took the honours in the 153cm Show Hunter pony on her stunning Dun Surprise, and it was no surprise that the pair went on to secure Champion Ridden Hunter Pony. Shannaghmore Honey Bee found her way back into the honours in the Novice Ridden Connemara, with rider Anya Teuton, also securing Champion Connemara and Reserve Supreme Champion Pony later in the day. Lucy Cunningham produced the beautiful four year old, Woodhaven Katie to take second in the Novice Ridden Connemara, while the Open Ridden Connemara was won by recently graded stallion, Rockfield Blackthorn and David Wightman. Adele Huddleson topped the Part Bred Class and earned Reserve Champion Connemara on Brookvale All Talk. Busy young star, Ellie McDonnell was back in the spot light in the Small Breed M&M, this time with Linksbury Popstar, who also earned Reserve M&M Champion. Megan Dumigan impressed the Judge in the Large Breed M&M on board Nebo Thomas Jones, also taking Champion M&M Pony. Adele was back in the winnings in the Intermediate Riding Horse with Brookvale All Talk, also earning Reserve Champion Riding Horse. Lucy Cunningham brought her stunning Off The Cuff out for the Intermediate Hunter, winning the class and the Intermediate Championship. 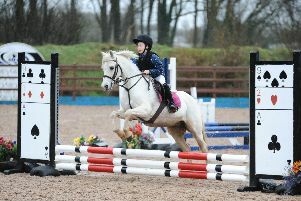 133cm Show Hunter Pony: 1st – Ellie McDonnell – Banksy Reveal; 2nd – Eva McGimpsey – Millford Spectacular. Intermediate Hunter: 1st – Lucy Cunningham – Off the Cuff. Reserve supreme champion – Anya Teuton on Shannaghmore Honey Bee.